BYU Sports According to Tasha: It's JIMMERTIME! This article popped up in my Google News feed today. As much as I love Jimmer, I must admit that I am one of those fans who feels slightly conflicted. Back in what I like to call "The Glory Days" (i.e. John Stockton, Karl Malone, Bryon Russell, Jeff Hornacek, et al), I was a die hard Jazz fanatic. I still feel the pain when I remember that formidable day in 1997 when the Jazz lost to my second-least favorite team (the Chicago Bulls) and one of my least-favorite players (Michael Jordan- blech!) in the NBA finals. The Jazz should have won that game, and yes, I'm still bitter about it. 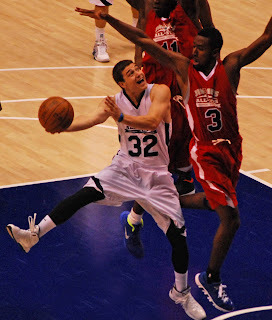 Now Jimmer is coming to town to play against the current, albeit extremely different, Jazz. I haven't seen the Jazz play yet this year, but I've heard some good things about them. Burks and Kanter seem to be good additions to the team, and I especially like Millsap and Hayward. While they started out kind of shaky, they've only lost 2 games so far in 2012. The Kings, on the other hand, are kind of sucking. But Jimmer is improving. He's had a harder time than I imagined he would coming into the pros and getting his rhythm. But I'm not too worried. He scored 20 points and 13 points in the last two games-- a big jump from his season average of about 8. Slow and steady wins the race, right? 1. It'd better be worth the money. I paid way too much for my crummy, way-in-the-top seats. When I told my sister how much I spent, she said: "Geez, for that much money, I think Jimmer needs to come sit next to you during all the time outs." Agreed. How 'bout it, Jim? 2. I really, really hope whoever owns the giant Jimmer head brings it to Energy Solutions. I miss that ingenious piece of signage. 3. I want the arena to cheer harder for Jimmer than they do for the Jazz. If the fans "Rise and Shout," I think he'll pull out his "assassin" persona (as referenced in the 2010-2011 "Amazing" DVD) and knock down an NBA career high. That is, if his coaches let him. And I think they'd be stupid not to-- it's their best chance to take down the Jazz at home if they can get the crowd on the "wrong" side. That's what I want to see. In the article I referenced earlier, KSLTV executive producer Chris Moore said he wants Jimmer to have a great game, but he wants the Jazz to win. However, when asked which was more important, he said, without hesitation: "Jimmer playing well. I want to see him play well." I'll close with another quote from the KSL article because I couldn't have said it better myself: "Whether you love the Jazz and the Jimmer, or if you can't stand one or the other, it doesn't matter, because the Jimmer Show is back in town and keeping the roof on the Energy Solutions Arena may prove difficult come Saturday night."